The first rule of running a sucessful business is give customers something no other business is providing. That's what the new Cascades golf course is doing. 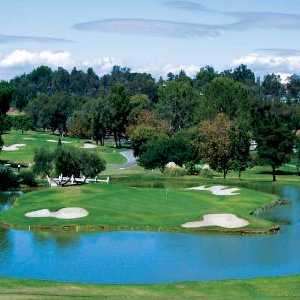 Set amid the canyon foothills of the Santa Susana Mountains, the par-71 championship course is the first upscale public golf course in the San Fernando Valley, one of the largest suburban areas in Southern California and home to thousands of golfers. 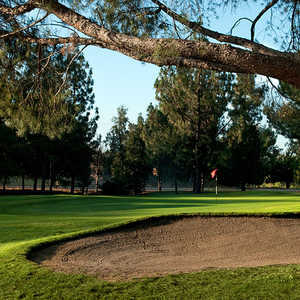 Only opened in mid-December, The Cascades has quickly developed a reputation as one of the best courses in the Los Angeles area. "I really enjoyed it," said Jim Simon, 45, who drove nearly 45 minutes from his home in Thousand Oaks to play the course. "I had heard good things it from some of my friends and so I wanted to give it a try. This area needed an upper-level course. I was very impressed and I'm sure I'll be back." Marketing director Colin Kaiser said the club's owners, Honolulu-based Royal Clark developers, felt the time was right for a high-end public course in this area, one that offers players a country club feel without the cost of a club membership. "This is a golf starved area," Kaiser said. "There have been very few new courses to open up in this area but over the next few years we feel there's going to be a lot more. "Royal Clark had this 110 acres behind their industrial park and they decided the best use for it was to develop a golf course, even though they had no previous connection to the industry. They hooked up with Cupp Design, Inc. and this is the result. We believe you're going to start seeing a lot more of these kind of facilities in the area, so it's nice to be the first." With more than six million people living within 30 miles of the course, Kaiser said they are confident they will draw golfers from all around Southern California. "We're already seeing that people will come from all over to play here," Kaiser said. "We're drawing from down south like from downtown Los Angeles and West LA, and from the west in Simi Valley and to the north in the Santa Clarita Valley. "We're very fortunate because we're located less than five minutes off the freeway so it's very easy for players to reach us." Kaiser works for Sunterra Golf, a management company that has added the Cascades to a strong resume of courses that it manages. Among its other clients are San Juan Hills in San Juan Capistrano, Cresta Verde in Corona, California and Beaver Creek in Arizona. "We're trying to attract both the local players and visitors that are coming to Southern California either for business or vacation," Kaiser said. "As we go along we're continuing to develop programs designed to draw players here." For the first three months the course offered reduced green fees of $50 Monday through Thursday and $75 Friday through Sunday. The regular green fees took affect on March 1, but they are still reasonable at $60 for weekday and $85 on Friday through Sunday. The Cascades also has the Par Golf Academy that offers a complete line of instruction for players. Kaiser said they have packages that range from a half-day lesson to three to five day curriculums. Kaiser said they are also getting involved with many of the hotels in Southern California in and effort to try and get more of the out of town players out to the course. "We recently hosted a reception for members of the Los Angeles Concierge Association," Kaiser said. "We wanted to have them come out and see the course because it's much easier for them to tell players about us if they have seen it personally." What people see when they show up is a course where co-designers Steve Timm and Bob Cupp poured the 18-holes around the existing terrain, giving the course a unique feel. "It's very rustic," Kaiser said. "It captures the essence of the canyon's wilderness. It's a course where you can really feel like you're away from everything." While it only covers 6,600 yards, Kaiser said the course plays much longer because of the natural terrain that creates a lot of elevated shots for players. "It definitely plays a lot longer than it looks," he said. "You may only have 150 yards to the hole but it's uphill so it plays longer and other shots you're playing down hill, so it's very challenging for players." While there's not a lot of land left over, Kaiser said there is discussion of using what is left to develop a nine-hole, either par-3 or executive course but those plans are still in the preliminary stage. For now the focus is getting the word out about the Cascades. Kaiser said by far their biggest weapon in that battle has been word of mouth. "We're getting a lot of repeat business," Kaiser said. "Players really like the course and when golfers find a course they like, they tell their friends and they keep coming back. Out objective is to do whatever we can to make this the best golf experience possible for every player that comes through here." 16325 Silver Oaks Dr., Sylmar, California. Amenities: Golf School, Pro Shop, Clubhouse (complete with locker rooms for men and women), Driving range with all grass tee and short game practice area, Restaurant. Cost: Monday-Thursday -$60, Friday through Sunday - $85.